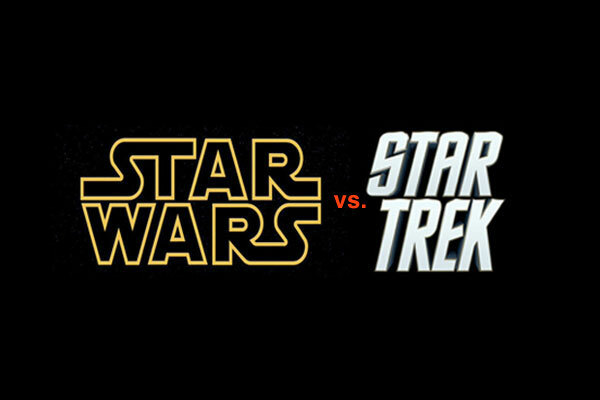 Star Wars vs. Star Trek: How do they Compare? By now you’ve probably seen Rogue One: A Star Wars Story which I reviewed here. (If not, there are spoilers ahead!) And you’ve likely seen the recent movie Star Trek Beyond reviewed here. Star Wars vs. Star Trek: each has its own particular appeal. Sure there are similarities, beyond just “Star” in their names and space travel. But in what ways do these two franchises differ, what is the unique appeal of each one? This article is not about which is better – I love them both – but rather their cultural significance and different approaches to storytelling. 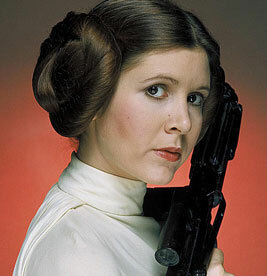 Star Trek gave us our favorite Vulcan who we lost last year, and Star Wars gave us our beloved Princess who we lost this week. With the 50th Anniversary of Star Trek just past with and the recent release of a Star Trek movie this Fall, along with a new Star Wars anthology movie this is all fresh in our minds, I’ve written history articles on both Star Wars and Star Trek. I’m going to compare and contrast primarily Star Trek: The Original Series and the original Star Wars trilogy of Episodes IV, V, and VI… with a few tidbits from the other movies in the canon. We’ll look at the differences in story structures, the character relationships, the literary genres, the cosmologies, religions, timeframes, governmental models, and the respective cultural contributions of each. These two cultural memes are inexorably connected. 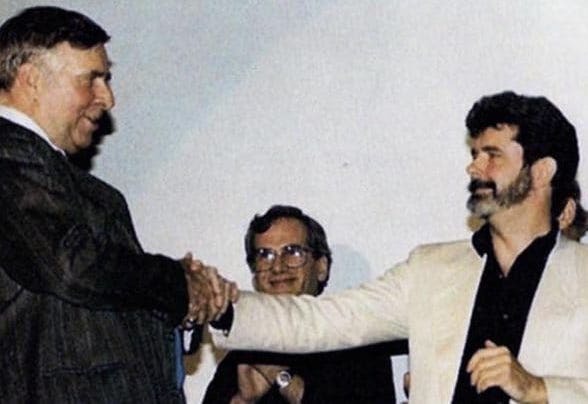 George Lucas admits that he was inspired to create Star Wars by watching Star Trek, among other influences. After Star Wars became an enormous and unexpected success in 1977, Paramount Television — who had bought Desilu Productions with its original property Star Trek — wondered how they could cash in on this “sci-fi space craze” and looked around at their intellectual properties. Star Trek was hastily rushed to the big screen as a major motion picture in 1979 and made lots of money, sufficient to continue the franchise as a movie series. Admittedly these two franchises are among the most popular in modern media — crossing TV, film, book, comics, animated series, games, and merchandising. Star Wars has been more financially lucrative, starting in film and selling more tickets and merchandise. Star Trek began with a larger corpus of content, 79 episodes on TV and in syndication compared to Star Wars’ original three-movie episodes spanned across almost a decade. Star Wars’ story was an epic arc as multi-hour major movie events across three episodes, while Star Trek had 79 one-hour episodes across three years. Star Trek was able to introduce lots of characters; some were recurring while others lasted only the one episode — or if wearing a red shirt, only until the first commercial. Star Wars had a more limited set of characters they could introduce and maintain focus upon while lots of minor characters passed in and out of the story. Star Wars takes the approach of the hero’s journey, as Lucas described what he’d learned from the Joseph Campbell‘s book The Hero With a Thousand Faces” that he read in college on mythology and archetypes. It’s the departure into adventure, the initiation of the hero, and crossing the return threshold. It includes Luke’s struggles through adolescence on Tatooine, the challenges and temptations of epic struggles, the striving for competency and reconciliation with the father figure, apotheosis and ultimate success. In that sense, it’s the story of a single solitary individual. In the case of Star Wars and the initial trilogy, it’s the story of Luke Skywalker: youth, pilot… padawan-novice-squire, knight. 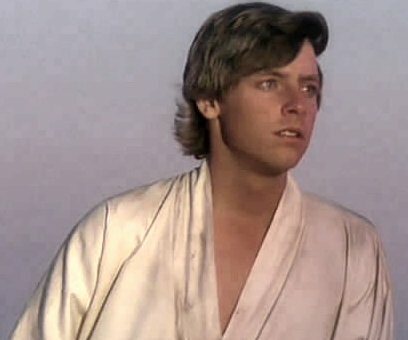 Or in the larger context, it’s the struggle of Luke in the framework of the greater narrative: his father Anakin Skywalker and his fall to the dark side and final redemption with his son Luke’s help, to defeat the evil Emperor and bring balance to the Force thereby fulfilling the prophecy. Is it about Luke’s journey, or Darth Vader’s? In a sense, both. 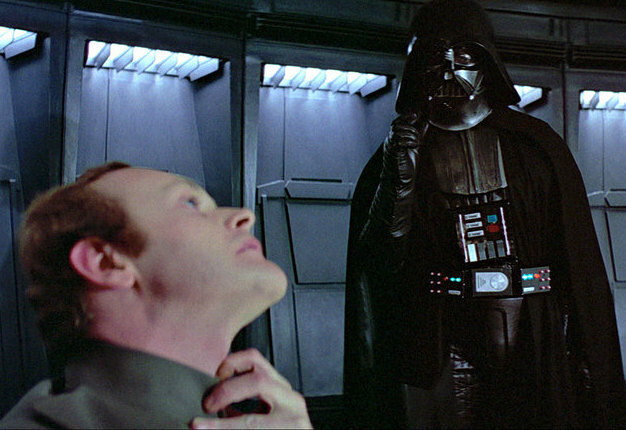 Lucas had conceived Darth Vader as his first character for the original Star Wars. The prequel, Episodes I, II, and III told his story, which was submerged in Episodes IV, V, and VI where Luke emerges as the hero and Darth Vader is redeemed by his son to bring balance to the Force by overthrowing the evil Emperor. In another sense, it is the story witnessed by the bystanders: R2-D2, and C–3PO. These droids are the only characters featured in all seven saga episodes, plus Rogue One. Indeed, these two are the very first characters we see in the original Star Wars movie. Star Trek took a different approach. 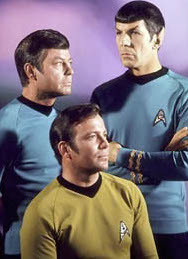 It focused primarily on three characters, a triumvirate of players: Kirk, Spock, and McCoy. It may not have started out as such, but it evolved that way. 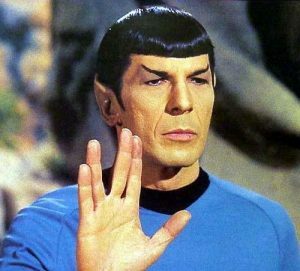 Initially, William Shatner as Captain Kirk was the star, but Leonard Nimoy’s Mr. Spock became such a popular character that he almost overshadowed the intrepid Captain. Soon, however, in addition to the logical Vulcan, DeForest Kelley was featured in the opening credits as Dr. McCoy. The evolution of their relationship allowed each character to bloom differently. With Shatner’s robust and vocal portrayal of the Captain — in contrast to the rather internal portrayal by Jefferey Hunter as Captain Pike in the original first pilot — Nimoy could afford to play a more reserved, more internal and cerebral Spock. Spock’s yin to Kirk’s yang. Spock was stoic, seemingly unemotional in his portrayal of the half-alien First Officer… “otherness personified.” McCoy was openly emotional and often impetuous. Kirk was intuitive and inspired in his problem-solving approach in the Captain’s chair. A stable triumvirate. Star Wars, on the other hand, was taken a different approach. 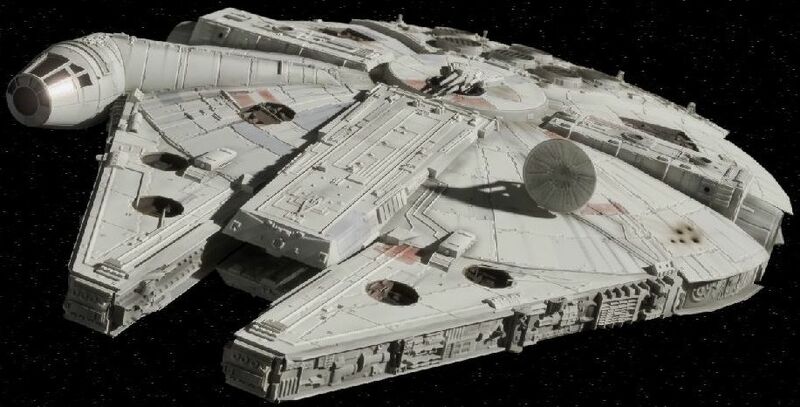 While “faster than light” hyperdrive travel in that universe is considered normal — “She’ll make point 5 past light speed” — and Death Star weapons of mass destruction are common, the vibe is more fantasy, space fantasy, than science fiction. It is true that it pays tribute to the older science fiction adventure serials of Flash Gordon and Buck Rogers with its text scroll at the beginning of each of the Star Wars saga movies (and noticeably absent from the anthology movie Rogue One.) However, it is more attuned to mythic fairy tales in space than traditional “hard science” fiction. More accurately, it is called space opera. There is a move toward the more mythic and noble weapons of a bygone era: the lightsaber rather than the blaster. We do, however, have a greater emphasis on robotic prosthetics in Star Wars, especially with missing limbs. We saw Luke obtain a new artificial hand in Episode V, and in the prequel, Anakin/Darth Vader gained hands, legs, and respiratory apparatus in Episode III. And while robotic and android creatures pop up in various episodes, it’s not until Star Trek: The Next Generation than we have an android Bridge crewman in the character Data. Star Wars has (an)droids everywhere. These are the droids you’re looking for. Star Wars suggests a psychic level of reality, beyond the observable empirical science. Luke is encouraged to trust in the Force rather than his targeting computer by Obi-Wan Kenobi as he approaches the reactor exhaust port at the end of the first movie. The Apple: primitive natives are required to make sacrifices to their god Vaal, a dragon-like idol that is the face of an underground computer. Who Mourns for Adonais? : the god Apollo requires worship. Kirk says they have no need for the gods, finding the one sufficient. Monotheism? For the World Is Hollow and I Have Touched the Sky: the citizens of Yoneda are highly religious practicing blind faith in the Oracle they worship. Wrong thinking is punished by implanted devices that deliver shocks. The Oracle is actually a computer on a generation ship. Return of the Archons: simple inhabitants are required to be part of the Body and are controlled by cloaked “lawgivers” who are directed by the omnipotent Landru, but during the Red Hour they become violent and sexually aggressive. Landru is actually a 6,000-year-old computer gone wrong. There is only one episode where religion, specifically Christianity, is depicted positively. And it is not identified until the end of the episode. To be sure, Star Trek dealt in morality plays, and often thinly cloaked discussions of contemporary politics. It wrestled with issues around colonialism with its “Prime Directive” to not infect primitive civilizations with advanced Federation technology. The Force has a good side and a seductive dark side, seen first in Darth Vader and later in the Emperor. Though not magic, it is misunderstood by outsiders who call it “Jedi mind tricks.” In Episodes I, II, III we learn that the headquarters of the Jedi Order on various planets are called Jedi Temples. The Force is a religion for a secular age. In the recent Episode VII: The Force Awakens we hear that Luke Skywalker has gone in search of the original Jedi Temple. In Rogue One we meet Chirrut Imwe (played by martial arts star Donnie Yen) and Baze Malbus (Wen Jiang) Guardians of the Temple of the Whills in the Holy City on the planet Jedha, a Temple for the Force-devoted. This concept was taken from an early draft of the original Star Wars script: “The Adventures Of Luke Starkiller as taken from the Journal of The Whills.”. The “Journal of the Whills” Lucas’ original idea as the platform for telling the Star Wars story, appears in the novelization of The Force Awakens by Alan Dean Foster… who coincidentally ghostwrote the original Star Wars novel in 1976. One thing that is often forgotten about the two series is that they are not both in the future. Star Trek is: it tells the story of what life should be like two centuries into our future and beyond. It is an optimistic future, without being overtly utopian. The members of the Federation do not need money, and there is no poverty. Creator Gene Roddenberry pitched it to the network as a western “Wagon Train in space,” or a Horatio Hornblower who has to decide policy independently far removed from headquarters. In contrast, Star Wars reminds us at the beginning of every movie that this is “A long time ago in a galaxy far, far away…” It’s not the future; it’s the past. And it’s not our past, but the past of a distant galaxy. The Star Trek cosmos features the Federation Of Planets, a United Nation-style of cross-planet organization. In many respects, it is “democratic.” The U.S.S. Enterprise — while part of Starfleet, a quasi-military service — is officially on a mission of exploration and scientific survey. It is, nevertheless, heavily armed with phasers and photon torpedoes. …namely the Death Star, which at that time was fully operational. The worlds of Star Trek were at different points along the evolutionary line of technological, industrial, and social development. However, Earth had abolished war, hunger, and poverty. The bridge of the Enterprise was ethnically diverse. Star Wars, on the other hand, was essentially feudal. There were gangsters and strong men like Jabba the Hutt; we heard of enslavement in the salt mines. In Episodes I-III we learn that Luke Skywalker’s father Anakin was a slave and the son of a slave. In their own ways, each of these franchises has had profound cultural and scientific impacts since they debuted. Racial diversity was portrayed on the show, especially on the Bridge. There was a half-human pointy-eared alien, a female African-American communications officer, a Japanese-American helmsman, a Russian navigator, and a Scottish chief engineer. Back in the mid–60s, we saw on Star Trek the first interracial kiss on network television. Nichelle Nicols at the end of the first season had been offered a musical theater role on Broadway and submitted her resignation to Roddenberry. He asked her to think about it over the weekend. Nicols went on to speak and sing at King’s funeral, and after Star Trek recruited women and minority astronauts for NASA. Both have changed our world and our vision for the future. Star Wars had better music and special effects. Star Trek had better characterization and technology. Which way are you going to go: Star Wars or Star Trek? The world of democracy or a feudal struggle against an evil Empire?